What an amazing, stunning and beauuuutiful setting, wow !! can only dream of being in such an inspirational place, and to capture it, a dream. Love it. Stunning.....no other words fit it. I'd love to go there! Great perspective...I like that the person is looking up, obviously enthralled by the same thing that we are, thanks to you sharing this image! Beautifully composed! Thank you for sharing this! This is amazing and i'm sure you are doing this wonderful sight justice with this shot. One of the most amazing places I visited in Iceland was this ice cave in the Vatnajökull Glacier National Park. 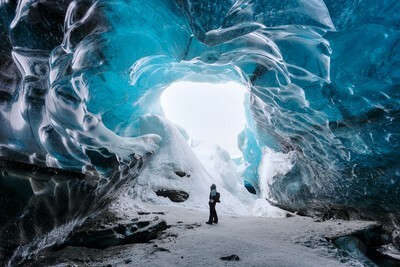 This park is home to one of the largest ice caps in Europe and the largest in Iceland, covering about 8% of the Country. The amazing blue color of the ice is created by the increased density of the glacial ice. The oxygen and hydrogen rich ice absorbs most of the visible color, but reflects back the blues that you see in here. This is quite an amazing and awe inspiring sight.